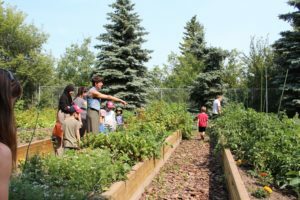 Just behind Alex Taylor School, in downtown Edmonton, is a lush green space sorted into manageable garden plots for nearby community members to work and enjoy. 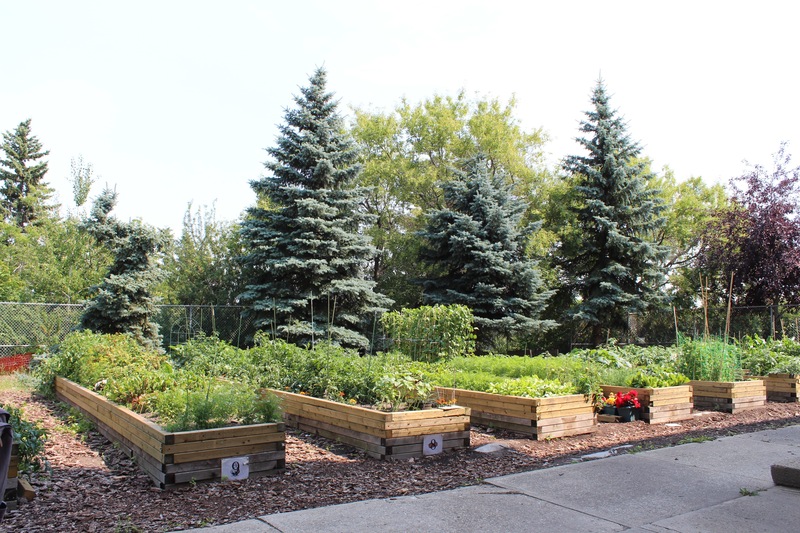 The e4c Community Garden was planted on the Alex Taylor School grounds in 2004 to provide willing neighbours the opportunity to grow their own food. Each of the garden members plants and maintains their own garden space while working collectively with others on common areas in the garden. Many gardeners live in apartments where they are not able to grow food. Every season brings a wonderful mix of vegetables, herbs, fruit, and flowering plants. Community gardens are recognized for improving food security, reducing stress, providing inclusive meeting spaces, and strengthening connections within communities. e4c staff at Alex Taylor School see the pride each gardener has in the space. The community garden is also environmentally sensitive and uses safe gardening practices, composting, and rainwater collection. Jasmine Monaghan, Acting Director, e4c Community Services, gives a tour of the community garden to participants of Taste 4 Kids. The community garden has 11 plots and 11 members who commit to cooperative tasks and regular upkeep of their designated space. A deposit of $25 is collected at the beginning of each season and $15 is returned at the end. The program keeps $10 from each member to use toward community supplies and upkeep materials. There is currently a waiting list to join the community garden. Just as a gardener tends to a plant to help it grow, e4c reached out to other community organizations for help with improvements to the community garden. 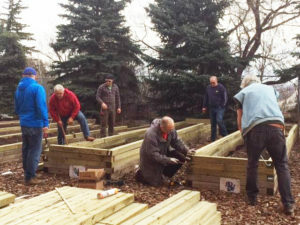 In early spring 2017, Sustainable Food Edmonton awarded a grant to e4c and the Rotary Club, Edmonton West, provided a gift in kind of 150 hours of labour and design. This generosity enabled improvements to the space and the ability to increase the height of the raised beds. The raised garden beds, increases the ability to broaden the selection of plants, and improves access for gardeners with mobility challenges. Members of The Rotary Club provide their expertise and elbow grease with improvements to the e4c Community Garden.